Well friends of Mary Jane, you can now be part of this tradition! 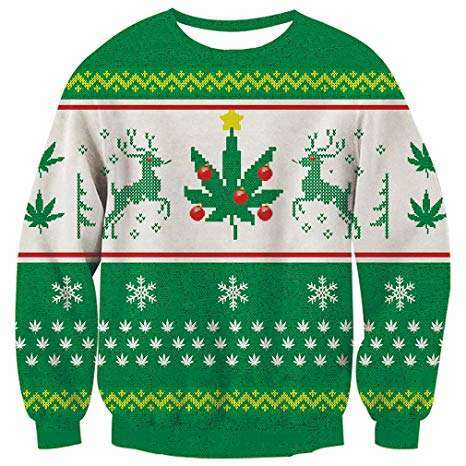 Check out this virtual fashion show of kitschy cannabis ugly Christmas sweaters! 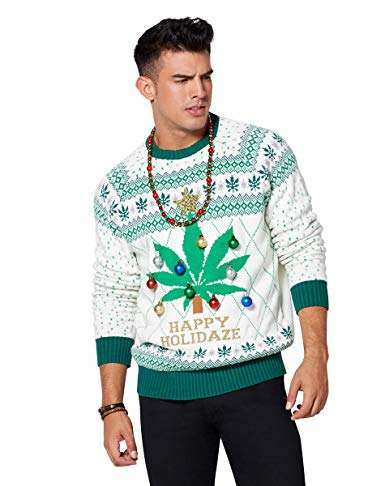 My favorite of all the is the Christmas Ornament adorned “Happy Holidaze” sweater above, but there are a surprising number of choices when it comes to Marijuana Ugly Christmas sweaters. The links on this page will take you to purchase information, in case you just gotta have it! 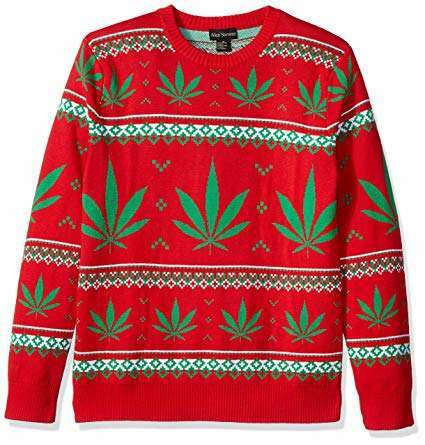 Red and Green unite in this classic jacquard pattern men’s crew neck Marijuana Ugly Christmas Sweater by Alex Stephens. Nothing says Christmas quite like Fresh Baked Gingerbread! Have a Merryjuana Christmas in this classic black style that’s anything but ordinary. 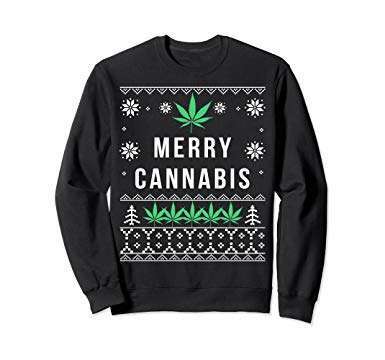 Subset of Marijuana Ugly Christmas Sweaters: Marijuana Ugly Christmas Sweatshirts! 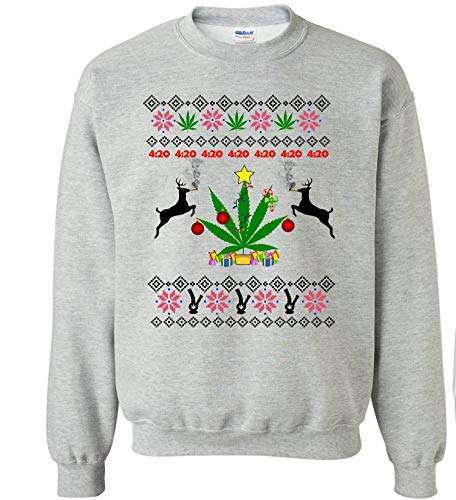 Classic Ugly Christmas Sweater style in an easy to wear sweatshirt. For the low key marijuana enthusiast, a holiday study in black and white. Excellent idea! Your friends will think so too, once they stop laughing. 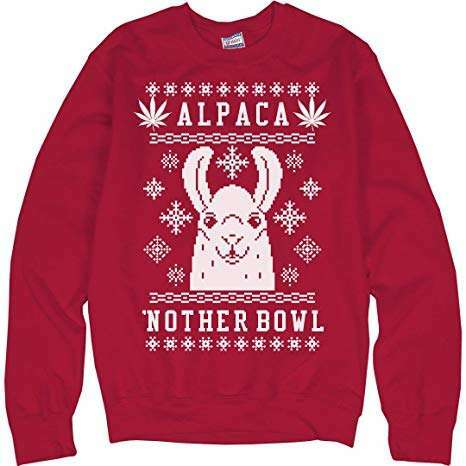 Alpaca Nother Bowl Ugly Christmas Sweatshirt. 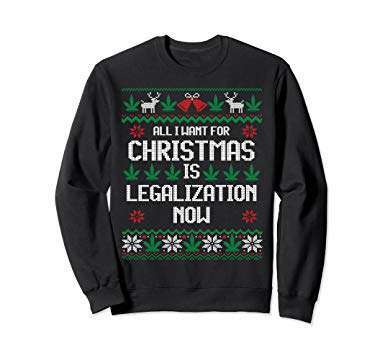 There’s even an Ugly Marijuana Christmas Sweater (or I should say sweatshirt in this case) for the activists in the crowd! 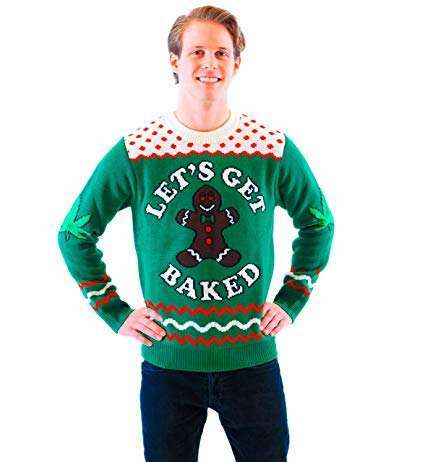 Here’s another take on the Let’s Get Baked/Gingerbread Man theme, this time in a sweatshirt. 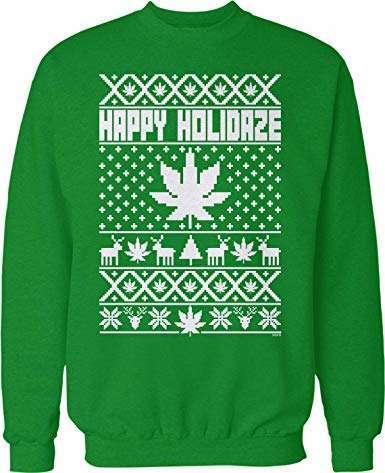 This one is a cornucopia of joyous weed and holiday images! Have a very Merryjuana Christmas in this snuggly sweatshirt. Simple to the point message. Sweatshirt is available in a variety of colors.